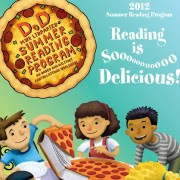 On Friday, June 15th The Combined Arms Research Library will be launching its Summer Reading program, “Reading Is So Delicious”. Come join the DOD incentive to encourage children and teens to read throughout the summer! Over the course of seven weeks, the library will have activities that entertain, promote healthy habits, and support a love of reading! There will be a weekly incentive to encourage reading! The excitement continues thru August 3rd. The kickoff event on June 15th will have a puppet play featuring “Goldilocks and the Three Bears”. Participants will also be able to choose their very own book, thanks to the support from the CGSC Foundation! Seed packets will be provided so that children can start growing their own vegetables. On July 13th participants will be encouraged to “Eat-Move-Read!” Come help to create the “kettle” for the story “Stone Soup.” Veggie pizza and other food related items will be provided. On August 3rd we will wrap up with an event featuring the Tomie de Paola story “Strega Nona” and talk about “What’s on your plate?” This activity will strongly encourage the best food choices for healthy readers. Please join us for all the fun in our temporary quarters! For more information call the library at 758-3053 or stop by the reference desk.